00:01:27.17	what do you have available? What's in your lab or department? 00:01:56.09	a lab to do the kind of microscopy that you need to do. 00:02:28.11	you being able to answer a particular biological question. 00:02:36.09	of your thinking of your choices and your project. 00:02:45.10	most expensive microscope out there to answer a biological problem. 00:03:42.27	or fluorescence. And this is perhaps a little bit of a gross generalization. 00:04:16.08	molecular marker. And for that, you have to go to fluorescence. 00:04:29.10	needed. You could just take your cells and image them right away. 00:04:46.06	light is less damaging to the specimen than fluorescence excitation. 00:05:08.04	closing in on a wound, a scratch made in a tissue culture cell. 00:05:17.26	behavior and how they migrate in this special circumstance. 00:05:35.10	the growth of individual and shrinkage of individual microtubules. 00:05:51.22	sample like this, transmitted light dark field can be very powerful. 00:06:08.24	choices of different kinds of fluorescence microscopy. 00:06:15.00	about what kind of specimen you have. Do you have a thick specimen? 00:06:27.29	that you have to go to see your objects, your fluorescence. 00:07:02.21	excitation. So the easiest type of fluorescence is epifluorescence. 00:07:18.02	you don't need any lasers. It's a very simple technique to use. 00:07:34.13	-- in epifluorescence, you have out of focus fluorescence. 00:07:55.19	the epifluorescence penetrates through the entire specimen. 00:08:04.29	not only in the plane of focus, but in out of focus planes, as well. 00:08:37.02	whether that gene knockdown affected the shape of the spindle. 00:09:20.11	technique really, which is deconvolution microscopy. 00:10:04.08	specimen, which is needed to do deconvolution microscopy. 00:11:02.23	sectioning. Most of them really pragmatically are done using lasers. 00:11:12.04	several different ways you can use lasers to do sectioning. 00:11:31.18	reflection fluorescence microscopy is a very powerful technique. 00:11:43.13	or so of the coverslip surface. But if your object is in that regime, it's very good. 00:11:53.25	of a tissue, you then may have to go to pin hole microscopy. 00:12:24.18	about another technique, which is two photon microscopy. 00:13:06.11	tremendous amount of just general blur from out of focus fluorescence here. 00:13:29.02	you're in that regime, how powerful TIRF microscopy can be. 00:13:44.12	of biochemistry that can be visualized on a glass surface. 00:14:28.23	with, at some point, a fluorescent tag on one of the molecules. 00:14:38.16	corresponds to an individual immunoprecipitation reaction. 00:14:48.14	at a single molecule level using this particular technique. 00:15:40.02	now let's go to the methods of confocal microscopy. 00:16:36.15	however, point scanning confocal microscopy may be better. 00:17:08.04	spinning disk confocal. So again, you might have to think about that. 00:17:29.12	very defined point in your sample, using the point scanning microscope. 00:17:39.02	specimen to see how fast that photobleach has recovered. 00:17:43.09	So that's a particularly good use of point scanning confocal. 00:17:53.02	kind of an interesting recent technique is light sheet microscopy. 00:18:22.15	have light damage above or below the field of observation. 00:21:31.22	computationally, to create this beautiful movie that you see here. 00:21:43.29	physical sections that have been intercalated together. 00:21:50.17	So, finally, we also discussed in this course super resolution microscopy. 00:21:55.02	Of course, this is a very new exciting technique in light microscopy. 00:21:59.29	There are several different methods that are out there. 00:22:11.10	improvement for some of these super-resolution techniques. 00:23:26.10	wide-field, it's not very impressive. It's just a little round blob. 00:23:39.26	resolution, as was done in this study by David Agard's lab. 00:24:54.09	or biochemical activity, will produce a readout of light. 00:25:46.21	potential in this neuron that changed the voltage in this cell. 00:26:15.09	but with light. So, finally, I'd like to talk about how to analyze images. 00:26:33.19	the optics, but you also learn to use image analysis software. 00:28:21.04	being able to look at living samples in many different ways. 00:28:40.21	living systems work. Thank you very much. 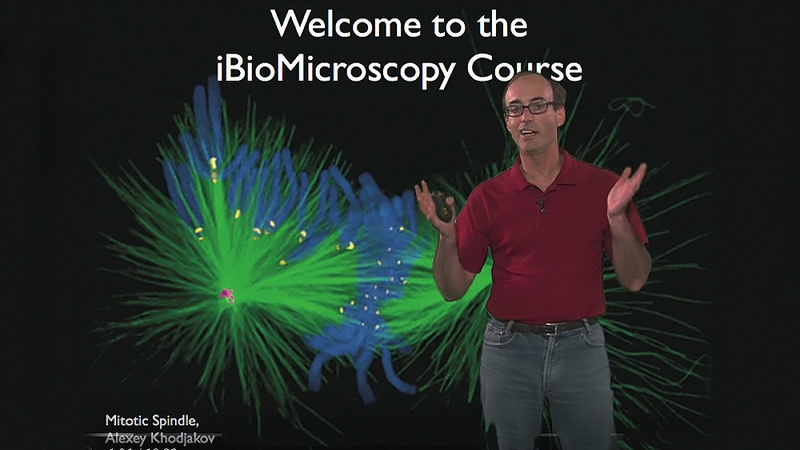 In this concluding lecture about choosing the right microscopy technique, Ron Vale summarizes the main techniques covered in the short course and provides an overview of when a specific microscopy method might be advantageous for a particular sample or biological experiment. Which of the following methods is best for fluorescence microscopy of thicker samples? Which of the following methods might be good for measuring biochemical reactions at a surface using fluorescence? Which of the following techniques might be well suited for examining mitochondrial dynamics in a living cell in culture with minimal photodamage? Which of the following techniques can be used to measure the dynamics of a chromosomal protein using FRAP (fluorescence recovery after photobleaching)? You are trying to resolve details of protein complexes that you suspect are spaced ~50 nm apart on the mitochondrial membrane of a Hela cell in culture. Which technique might be best suited for this project? 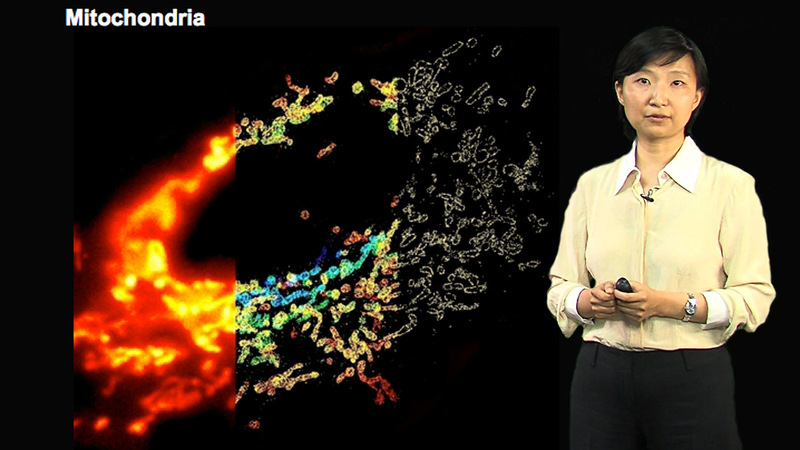 Which of the following forms of microscopy routinely involves laser illumination? True or False: Spinning disk confocal has an equivalent depth of imaging as point scanning confocal microscopy.